Last weekend was the H.P. 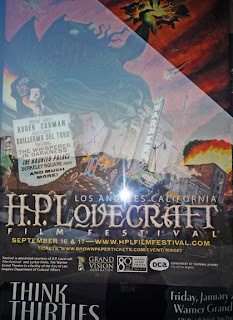 Lovecraft film festival at the Warner Grand Theater in Los Angeles. This is a really cool poster that's hard to see thanks to my lame photography skills. We raced up to L.A. after we picked up Chloe from school on Friday at 2:30pm. We arrived at our hotel at 6pm (this drive usually takes 2-3 hours) to discover that even though we booked a room for 5 people there were only 4 places to sleep and they refused us a roll away bed! 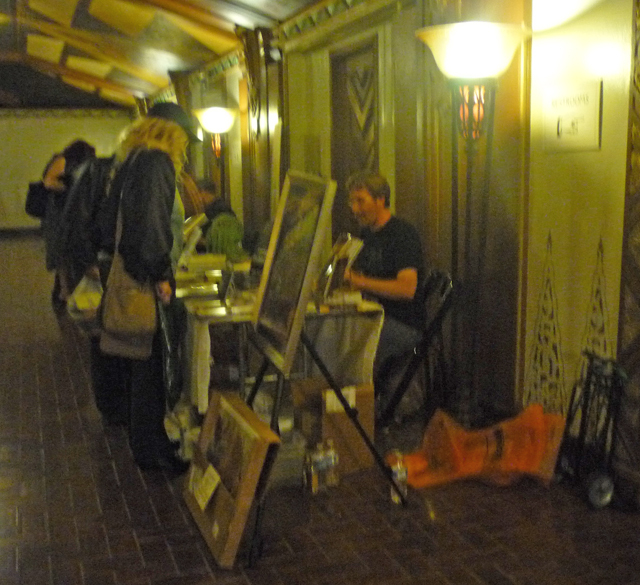 Mike was a guest at the festival and his art was shown as slides between films. Here he is selling his art and books . Though it doesn't look it this was actually a pretty crowded event. After spending a lot of time in the "Green Room" eating the complimentary food for guests, and playing cards. 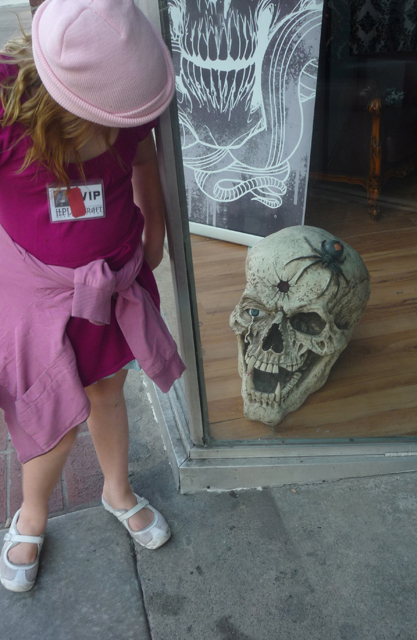 I managed to get the girls to come for a walk around town with me. Naomi found a skull. 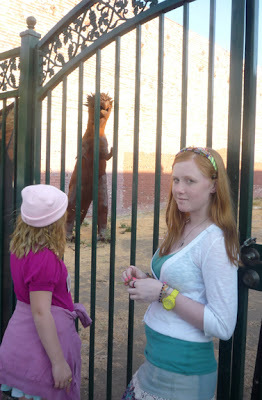 A dinosaur lurked beyond this gate. The festival was great but exhausting. Especially the part where we took turns sleeping on the floor. And the part where my kids were so tired they woke each other up to fight and yell some more. That was the worst night in a hotel in recent memory. 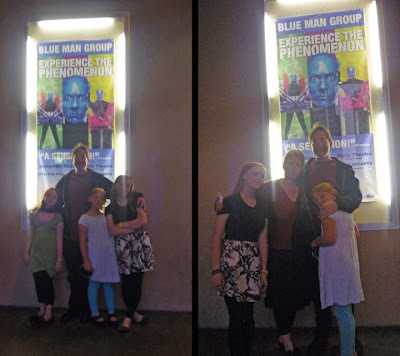 In these lousy pictures we are posing in front of the poster for "The Blue Man Group". Which was an amazing extravaganza and if you have never seen them... GO! 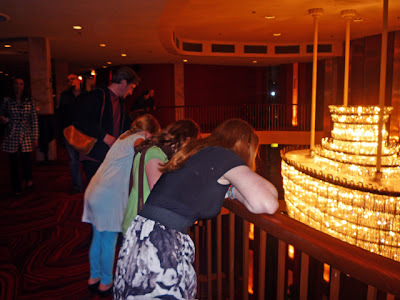 The Civic Theater downtown is a great venue. Mike and the kids are studying the massive chandelier before the show. Happy Birthday Mike! This week I've continued to work on the sets for "Nunsense" which is opening horrifyingly soon! 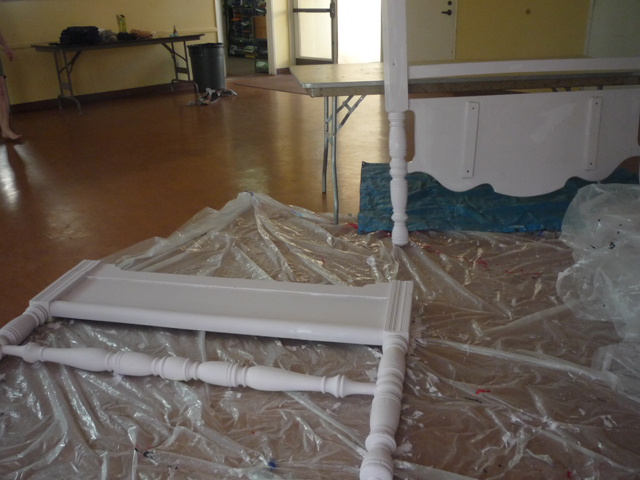 As you can see I've started on Sandra Dee's bed frame. Time's running out and yes, I'm a little panicked. Today I start teaching art again through an afterschool program at a local elementary school. They gave me a curriculum... I'm changing it (yes, I have permission), but seriously, lesson one is drawing 3 different kinds of lines!! Forget that we're doing cartooning. 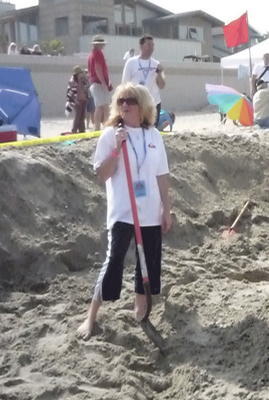 Today my heart goes out to our friend and team mate from the US Open Sandcastle Competiton , Kristen Clark Magnus, who was bitten by a baby rattlesnake in her garage yesterday. She was kept overnight at the hospital for treatment. Speedy recovery Kristen!! I am wildly impressed. 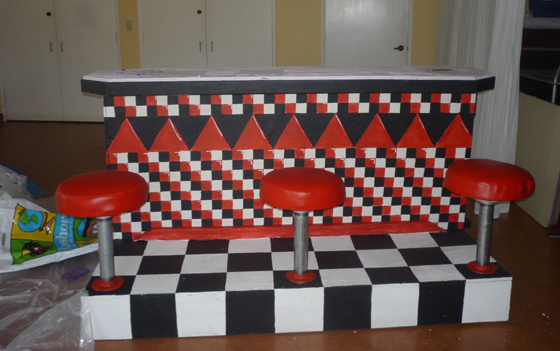 I just love artists and you can be sure that I will come back often! I love the counter in the post below as well. I think I want it!